What I find is that the bigger lessons of having visited the World Trade Center Towers didn't come that day. No, the lesson that sticks with me, that permeates my every thought about this tragic, terrible day came later, and it is this: it could have been me. It could have been you. It could have been any one of us. There are so many tragic things to come from the terrorist attacks on 9/11. Such a crazy, insane 10 years ensued, that it is hard to pinpoint exactly where even to begin. Without a doubt, it is the most defining moment of our time. What the idyllic, idealism of the 90's brought, 9/11 and the ensuing decade ended. The wars, the extremity of our politics, the religious extremism at home and abroad, the mounting debt, the Great Recession - it would all be easy to focus on. But for me, what I want to focus on is the people. That's all it's about anyway, isn't it? 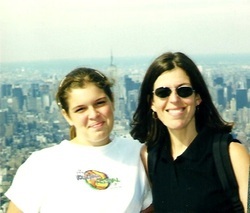 In protest to terrorism, to the extreme anti-woman sentiments of Al Qaeda, and in honor of my love and our support of the city, my mom and I went to New York in the spring of 2002 to celebrate my 16th birthday. What we saw then was a city in mourning. Ground Zero was a gaping hole where the towers once stood. The blocks surrounding it were plastered with flyers with faces of the missing; the ones who would never come home. Until that moment, it was hard to grasp the loss, hard to grasp the depth of the wound suffered. So many of us sat and watched from thousands of miles away in horror as the towers fell and the death toll came in. But here in front of my eyes, were the people that counted the toll. Everyday people going to work. Firefighters trying to save. Mothers, fathers, daughters, sons. All lost for no reason but to instill fear. History is our greatest teacher. How do we learn from tragedy? How do we grow? I offer to you, in opposition to extremism everywhere and in honor of those killed on this day, ten years ago, a message of love. Because, in my view of things, it is the opposite of terrorism. Through the eyes of love, we stand for ourselves and we stand for others. We move to the middle. We listen better. We compromise. We imagine the world a better place. And what we imagine, we can then believe and what we believe, we can then accomplish. So today, I choose to focus on love, in its greatest, most encompassing sense. Doubtless, we will mourn. And so we should. Because it could have been me and it could have been you, too. And if today were the anniversary of my final day, I would want my legacy to be one of the enduring power of love.